The 310 SLX demands everyone’s full attention. And by everyone we mean not only the abundance of people who can lounge comfortably onboard, but also the passersby whose heads will turn at the iconic styling and elegant hull sculpting. 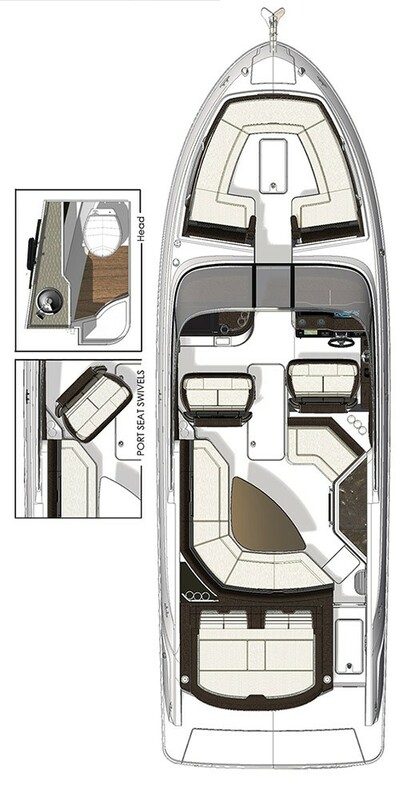 An expansive cockpit social area, an aft-facing lounger that converts to a sunpad, and a standard wetbar make relaxation and onboard entertaining a given. Underway, the delight of good company merges with the thrill of precision performance, as the SLX’s available twin MerCruiser engines and innovative Quiet Ride™ hull featuring Tuned Transom® combine forces beautifully. The Axius® joystick propulsion system puts control of the 310 SLX in the palm of your hand. Tight fairways and docks are a breeze, with easy movement in any direction, spinning in place, and Skyhook for effortless station-keeping. So simple a child can do it. Simple for adults, too. Large bow area fold down arm rest lounges & under seat storage on both port and starboard sides. Large rear lounge & dining with under seat storage and cup holders.